Nothing sums up Madrid more than sitting out on one of the city’s many terraza’s and enjoying an ice cold beer alongside some world-class tapas. 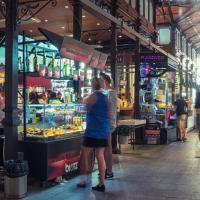 Join a hand-picked Host as they take you to some of the best tapas bars in Madrid, sampling local delights as well as some Spanish favourites from further afield. As your Host takes you through central Madrid you’ll be able to see some of the city’s most famous landmarks such as Plaza Major and the Puerta del Sol. As you go you’ll learn all about the world of tapas, as well as visiting bars that you won’t find in any Madrid guidebooks! 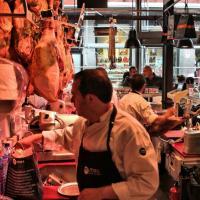 Visit one of Madrid’s most exciting eating experiences; Mercado San Miguel. Originally built in 1916, this beautiful iron and glass structure now acts as a gourmet tapas experience with over thirty different stalls selling everything from tapas to cured meats and of course great local beers and wine. Take some time to explore the fresh produce stalls, taking in all of the sights, sounds and smells that surround you. As you walk the historic streets of central Madrid you’ll be blessed with views of the ever restless Plaza Major, as well as getting the chance stand on the Puerta del Sols Kilometre zero, the geographic centre of all of Spain. Next up is a trip to one of Madrid’s best kept secrets, the authentic and traditional Taberna Malaspina. 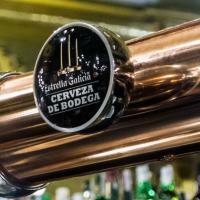 This is one of the best places to get tapas in the entire city and with a menu that is filled with seasonal Spanish favourites, you’ll be sure to taste some of the best food and drinks that Madrid can offer. 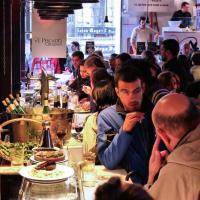 Join your personally chosen Host as they take you on a journey to discover some of the finest tapas bars in Madrid! Take in all of the sights and smells of one of the city’s finest eating establishments; Mercado San Miguel. Walk past a handful of Madrid’s most iconic landmarks on your travels through the central district. Act like a local as you taste authentic Spanish tapas in the rustic and traditional Taberna Malaspina.